1. Combine the raw banana / ethakka pieces with all the other ingredients numbered 2. Set aside for 5 minutes. 2. Heat coconut oil in a pan (preferably non-stick). Add the ethakka pieces and fry over low-medium flame for about 8 – 10 minutes until both sides turn golden and done. Serve with rice and other side-dishes. 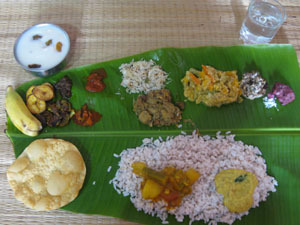 We had it with kerala rice, pulisseri, pappadam, thenga chammathi, beans thoran and chembu aviyal.